Return to the Orlando mass shooting menu. Omar Mateen, 29 was a U.S. citizen. Many people believe that he was an Afghani immigrant because of an incorrect statement made by Republican Presidential Candidate Donald Trump shortly after the massacre. In fact, his parents had emigrated from Afghanistan to the U.S. before Omar was born in New York City, NY. Photo of Omar Mateen, from the Orlando Police. 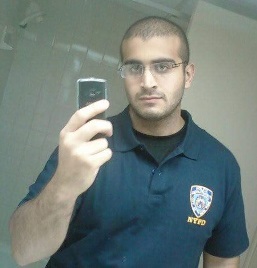 Although he is shown here wearing a shirt with a New York Police Department (NYPD) logo, he had never worked for or had any connection to that force. The shirt can be purchased from commercial sources by the general public. During early 2016-JUN, Omar Mateen purchased a Glock handgun, an AR-15 semi-automatic rifle, and ammunition. These were the weapons that Mateen later used during the massacre. His wife, Noor, age 30, accompanied him to the gun store. She apparently suspected that he might be planning a mass murder and allegedly tried to persuade him to not do it. Unfortunately, she did not take the next step and contact the police with her suspicions. She may now be charged with one or two counts because of her failure to report an impending felony. At about 2 AM Eastern time, on Sunday morning, 2016-JUN-12, Omar Mateen arrived at The Pulse nightclub in downtown Orlando. It was "Latin Night;" many Hispanics were at the club. He had an altercation with with a security guard outside of the club. Shots were fired. Mateen was able to enter the nightclub. He opened fire at random, killing many patrons. He marshaled many hostages into a washroom, and killed some there. The police used an attack vehicle to punch holes in the wall of the building. Mateen emerged from one hole, shot at police and was himself killed. He died at the scene. Unfortunately, this means that police will never be able to determine directly from Matteen exactly what his motivations for the mass killing were. A total of fifty people died, including 49 patrons at the nightclub and Mateen. Fifty three others were wounded. Fortunately, the Orlando Regional Medical Center is located only about two blocks from the club. Many of the wounded were able to walk or be carried to the hospital. Others were shuttled by ambulance. The Center had a very effective disaster plan in place to handle the massive influx of victims. "If we stand together, hope will find a way." The original police photo was apparently reversed from left to right. The NYPD insignia on his shirt is backwards. We reversed the original.